Surface crusts and accumulation of solids represent a sizeable problem in animal production, as well as in home sanitation and dry toilets. The crusts and heaps become nesting grounds for insects while also blocking flow. In addition to reducing odors, Bio-STAR natural bacteria possess superior digestive capabilities, and secrete large amounts of enzymes specific to manure and liquid manure. Those enzymes solubilize matter to render the manure as liquid as possible, eliminate crusts and allow better flow. 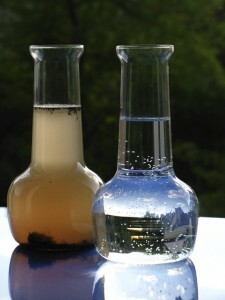 Furthermore, the result of the breakdown frees water, another agent for liquefying manure, as well as carbon dioxide. The bacteria in Bio-STAR agricultural products allow to increase the natural process of organic matter transformation. These selectively adapted bacteria oxidize malodorous compounds, and have a greater ability to contend with intestinal reducing bacteria by reason of their superior digestive capabilities. The quick bio-enzymatic action prevents the reaction of certain compounds by acting directly on the complexes that cause bad odors. Thus with the regular use of Bio-STAR, odors associated with fermentation can be reduced, creating a safer working and breeding environment.